In the last weekend of January, I took a road trip back to my hometown* of Tapawera to do a weekend painting workshop. 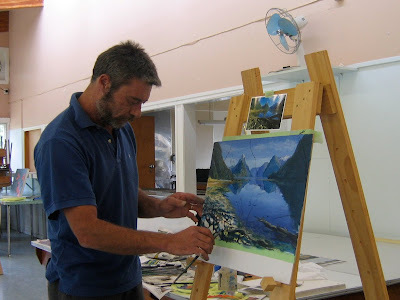 The Visual Arts Society of Tapawera had organised the workshop to be taken by award winning mural and trompe l'oeil artist Marc Spijkerbosch. My mother is a member of the society, but as she isn't a painter, and I've been known to do the occasional painting, she thought I might like to take part. 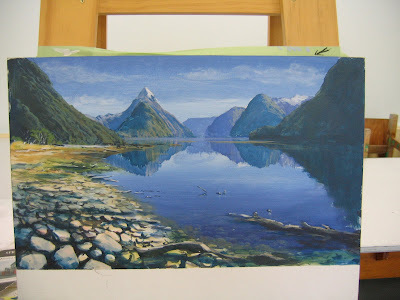 Our project for the weekend was to paint a picture of Mitre Peak. Marc took us through the process step-by-step, and like all good painting tutors, made it look really easy. You'd think I'd have learned by now that it's never as easy as they make it look... but no. On the first day it was quite hot, and the paint was drying as soon as it went on the canvas which was a little frustrating when you were trying to blend it. So I wasn't real happy with my efforts after the first day of painting. 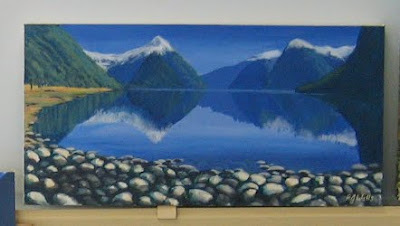 On the second day we worked on the foreground, and learnt some glazing techniques which I have never done before, plus some other tricks like how to paint underwater rocks. 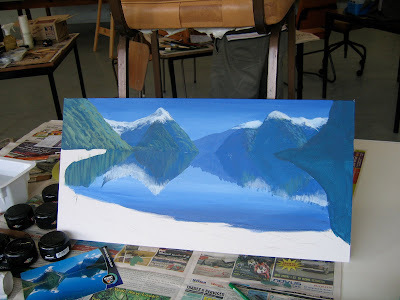 Marc's finished painting – ie what mine was supposed to look like! I think it was a successful weekend all up. I learned some new tricks, and have more confidence to attempt some of the more difficult aspects of landscapes in the future. While I was there, I went to take a look at the VAST exhibition which had a fantastic array of talent. There was also an amazing quilt exhibition on at the school hall, which I will dedicate a seperate post to. It was a little strange walking in my old school for the first time in over ten years! There was also a motorhome rally on in the school grounds (it was a long weekend in Nelson), so I went for a walk around the school too. It was funny how some things were exactly the same, where others were completely different to how they were when I was there. I also took a look through the trunk of paintings my grandmother did. I had looked through them more than once before, but it still felt like I was looking through them for the first time. I was really impressed by the variety of different subjects and mediums she had used, there seemed to be an example of everything. Except acrylics, which is what I usually use! *It's far too small to be considered a town, really. Village is probably a better word. I hope you're really proud Rose, because you did great! I so wish I could paint.